Chances are that if you carried a camera through the state of North Carolina in the past three decades, you were lucky enough to shake the hand of AP Raleigh staffer Bob Jordan. The ultimate professional and tireless advocate for his members, Bob Jordan retired from The Associated Press April 9. After 44 years in journalism, 27 as The AP staff photographer in North Carolina, Jordan, 62, retired. That doesn't mean he's hanging up his cameras. His plans to move to Florida include continuing his love of photographing wildlife and freedom to edit, assist or shoot when and where he wants. "I don't ever remember coming to an ACC basketball game in North Carolina and not seeing Bob," says SI staffer Manny Milan. He was a fixture at ACC sporting events and tournaments and was given the Skeeter Francis Award during this year's ACC basketball tournament for his work. Bob Jordan is much more than a sports photographer. He has probably covered more hurricanes-those on the coast as well as those on the ice than any single working photojournalist. His experiences include everything from Super Bowls and Final Fours, to the first Gulf War, an earthquake in Iran, and strife in Somalia. 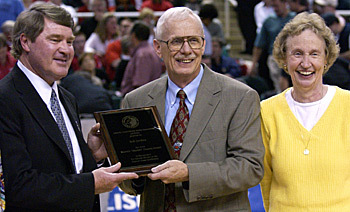 ACC commissioner John Swofford, left, gives the Skeeter Francis award to Bob Jordan and wife, Sigrid at the 2004 ACC basketball tournament. Jordan's organizational skills were as well known as his photos. Many young photojournalists, lucky enough to work for one of the many small newspapers that dot the North Carolina countryside were always welcome to hear the stories and learn from his experience. There aren't many stringers or full-time newspaper shooters that don't know about Jordan's 6P's - Prior Planning Prevents Piss-Poor Performance. Often to the groans of his stringers and co-workers, Bob was always the first one at an assignment and usually the last to leave. Back in the days of processing film and making prints for members, Jordan's AP darkrooms were legendary for the quality of work, speed and efficiency. Bob's career started at the Indianapolis newspapers and then stints as AP staffer in Detroit, Atlanta and then Raleigh, NC.